To evaluate if the provision of clinical dental care, by means of the main curative procedures recommended in Primary Health Care, is associated with team structural characteristics, considering the presence of a minimum set of equipment, instrument, and supplies in Brazil’s primary health care services. The Brazilian model of health care, which has Primary Health Care (PHC) as its main point of entry, aims to care for the health problems of high prevalence and relevance. Thus, the dental care established and provided in PHC deals with the most prevalent oral diseases. With the inclusion of the dental health team (DHT) in the Family Health Strategy, it became possible to establish an effective dental practice. This may be further favored by the inclusion of an oral health technician, for example, which may eventually produce a positive impact in work processes, or by the establishment of a workload of at least two shifts per day, which is essential for improving access to care. Likewise, permanent education is a professional qualification strategy that allows the creation of a space of practices for the reorientation of work processes that may ultimately lead to an improvement in the quality of care. https://doi.org/10.5020/18061230.2016.p8... , and there are no previous studies evaluating which structural factors are relevant for a better clinical performance of DHT within PHC. Thus, in the scope of an evaluative study of PHC DHT, this study may contribute in mapping the provision of a set of clinical dental care procedures (e.g. curative actions), in addition to providing further analysis about the public oral health network in Brazil. Through a national analysis of the structure of DHT within PHC, this study seeks to support the decision-making process, reflecting in the construction of subsidies to guide management processes, as well as to strengthen oral health actions. Given that, the care provided is directly related to the clinical performance of the DHT and to structural characteristics of the PHC services. The aim of this study is to evaluate if the provision of clinical dental care, by means of the main curative procedures recommended in PHC, is associated with team’s structural characteristics, considering the presence of a minimum set of equipment, instrument, and supplies in Brazil’s primary health care services. A cross-sectional exploratory study with multicenter data collection across Brazil, carried out between March and December of 2014, in 24,055 Primary Health Care Teams that adhered to the second cycle of the National Program for Access and Quality Improvement (PMAQ). For this study, 18,114 PHC with DHT were assessed, corresponding to 81.5% of the DHT in Brazil. For data collection, external evaluators were selected and uniformly trained with a field manual. The data collection was carried out in loco using tablets, each containing an app with a previously tested and standardized instrument. A data collection qualification protocol was established and consisted of five criteria: correspondence of geographical coordinates captured by the instrument, time length of the data collection per module, start and end hours of the assessment, ratio of unanswered questions and answers with repeated characters. The questionnaire was applied during an interview, in which info was gathered by means of provision of documentation on identification, functioning, and structure of PHC services and assessment, in loco, of dental equipment, instruments and dental supplies. In addition, data were collected by interviewing a member of the dental health team. https://doi.org/10.1590/S0034-8910201000... . The dental equipment were assessed by the presence of the following variables: dental chair that went up and down and tilted, dental cart, light reflector, basin, saliva ejector machine, high and low speed handpieces, air compressor with safety valve and dental stool (exclusion in Figure). The assessment of the procedures was made by asking the dentist: “Does the dental health team perform the following procedures?”. 1) Scaling and root planning; 2) Resin composite filling; 3) Amalgam filling; 4) Pulpectomy and; 5) Simple tooth extraction (deciduous and permanent teeth). The structure for the execution of the procedures was assessed according to equipment, instruments, and supplies available. For all procedures assessed: mouth mirror, explorer, cotton tweezers, personal protective equipment (glove, protective eyewear, surgical mask, protective clothing and hood), saliva ejector and anesthetics material (anesthetic and carpule syringe with needle) was mandatory, with exception of the latter for scaling and root planning. Besides these, the equipment, instruments, and dental supplies required for each procedure are presented next: 1) Scaling, root planning: periodontal probes, pads, ultrasound or curettes with sharpening stone; 2) Resin composite filling: photopolymerizer, calcium hydroxide and its applicators, dental drills, excavators for dentin, composite resin, acid and adhesive system, insertion spatulas, dental microbrush, articulating paper, cotton rolls; 3) Amalgam filling: calcium hydroxide and its applicators, amalgam burnishers and condensers, dental drills, excavators for dentin, amalgam carrier, articulating paper, amalgam capsule with amalgamator or amalgam set for manual preparation; 4) Pulpectomy: dental drills, excavators for dentin, endodontic files or barbed broach, irrigation syringes, intracanal medications, temporary restorative materials, cotton rolls; 5) Simple tooth extraction: bone forceps, scalpel handle and blade, elevators, surgical curettes, child and adult forceps, bone files, needle carrier, syndesmotome, surgical scissor, dental suture thread, pads, disposable syringe for irrigation. The exploratory variables assessed and related to the structure were the following: i) dental health team modality (modality I, including one doctor of dental surger and one oral health assistant (OHA); modality II, including one doctor of dental surger, one DHA and one oral health technician; and parameterized DHT including two doctor of dental surger (working 20 hours per week/each), one OHA and one OH technician); ii) quantity of shifts and days in service, per week; iii) conduction of a health status analysis (yes or no); iv) monitoring and analysis of the dental health indicators and planning of activities and scheduling of actions (yes or no). The exploratory variables of the dentist were: (i) employment status (Temporary Agreement; Statutory Public Employee; Commissioned Role; Self-employed or other; Public employee under Brazilian Employment Law (CLT); CLT agreement); (ii) career plan (yes or no); (iii) graduate studies in public health or family health (residency program, specialization degree, master’s degree or doctor’s degree); (iv) permanent education (yes or no). The outcome was created from the confirmation of five curative procedures performed by the doctor of dental surger in PHC, considering the presence of minimum equipment, instrument and supplies to the execution of these. The outcome was dichotomized in: 1) yes when the dentist carried out the procedure and had all the materials, and 2) no. Data were analyzed using the software SPSS v21 (SPSS Inc.; Chicago). The chi-square test was used to analyze the existence of associations between the independent variables and the provision of curative actions. Poisson regressions with robust variance were used to obtain the crude and adjusted prevalence ratios with their respective 95% confidence intervals. In the adjusted model, we included theoretically relevant variables, which show some degree of association during the analyses. Stratified analyses by procedures were also performed. The project was approved by Universidade Federal do Rio Grande do Sul’ Ethics Committee under Process 21904. This study assessed 18,114 dental health teams all over Brazil. Of those, 1,190 were not analyzed because the dental equipment needed to carry out the curative or restorative procedures was not available in the PHC service (Exclusion, as presented in Figure). 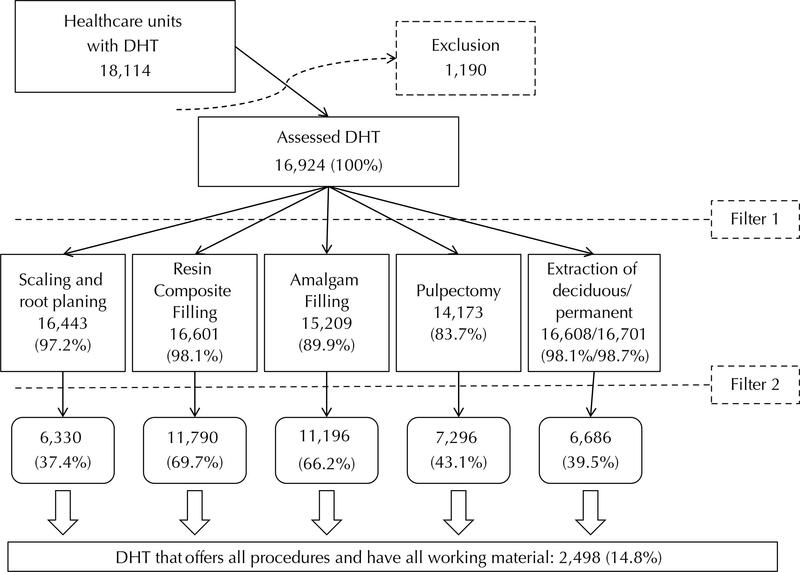 The 16,924 remaining DHT were assessed in this study and the frequencies of procedures are shown in Figure. Resin composite fillings (16,601), permanent (16,608) and deciduous (16,701) teeth extractions were performed more frequently by DHT in the PHC, while 14,173 performed pulpectomy (after filter one, Figure). The number of DHT with minimal structure to the provision of the procedures with all materials was, as follows: 6,330 for scaling and root planning, 11,790 for resin composite filling, 11,196 for amalgam filling, 7,296 for pulpectomy, and 6,686 for simple tooth extraction. Only 2,498 DHT (14.8%) had all assessed items (after the second filter application [Material Filter], Figure). Table 1 describes the presence or lack of equipment, instruments, and dental supplies in the remaining 14,426 DHT, depicting an overview of Brazil’s primary care dentistry structure. Results of the outcome and its association with exploratory variables are presented in Table 2. The outcome was significantly more frequent in teams of modality II and parameterized; that were open in three shifts, and six days of the week; DHT that performed analysis of the health status; monitored and analyzed oral health indicators; that programmed and planned activities; and whose dentist was a public employee under Brazilian Employment law; had career plan; had graduate studies in public or family health and that took part of Permanent Education. Distribution between exploratory variables assessed in respect to the provision of curative procedures of oral health. The unadjusted analysis was somewhat similar to the adjusted, with exception of number of workdays per week (Table 3). When the variables regarding the DHT modalities were assessed, Modality II (PR = 1.16, 95%CI 1.14–1.19) and parameterized DHT (PR = 1.11, 95%CI 1.03–1.19) had better performance. Regarding the working hours, DHT that opened two (PR = 1.34, 95%CI 1.27–1.42) and three (PR = 1.63, 95%CI 1.54–1.74) shifts per day, and DHT with five (PR = 1.13, 95%CI 1.07–1.19) and six (PR = 1.25, 95%CI 1.04–1.50) days of operation per week also had better performance. DHT in which management provided information to aid in the health status assessment (PR = 1.14, 95%CI 1.11–1.17) and that monitored and analyzed dental health indicators (PR = 1.12, 95%CI 1.10–1.15) had better performance. Additionally, DHT that planned and scheduled its actions monthly within PHC also performed better (PR = 1.03, 95%CI 1.01–1.06). Crude and adjusted analysis between the outcome and associated factors. The type of employment contract was also critical for the outcome; the best results were achieved by statutory employees (PR = 1.09, 95%CI 1.06–1.12), as well as by public employees (PR = 1.27, 95%CI 1.23–1.32) and by those whose contract was managed by the Brazilian Employment Law (CLT – Consolidação das Leis do Trabalho) (PR = 1.16, 95%CI 1.13–1.20). Additionally, dentists with career plans (PR = 1.10, 95%CI 1.08–1.13), graduate studies in public or family health (PR = 1.07, 95%CI 1.05–1.09) or those who underwent permanent education activities (PR = 1.23, 95%CI 1.19–1.27) were more likely to provide all procedures with the required material (Table 3). Table 4 presents adjusted prevalence ratios stratified by each procedure. The results were similar and followed the same direction as those found and described in Table 2. It is worth mentioning that simple tooth extractions had no association with any of the studied exploratory variables, except for a third shift (PR = 1.01, 95%CI 1.01–1.02) and permanent education (PR = 1.02, 95%CI 1.00–1.03), even though they were of small magnitude. Multivariate Analyses between each procedure and associated factors. https://doi.org/10.1097/MD.0000000000001... . This may explain the associations of small magnitude with only two of the studied variables. https://doi.org/10.1590/S1413-8123200700... . The results presented here confirm this assumption, as management variables were associated with better outcomes. For example, availability of information for the analysis of health situation and monitoring of dental health indicators was relevant for the provision of curative actions. The main limitation of this study is that it analyzed DHT that voluntarily adhered to PMAQ-AB. On the other hand, the study has strong points. The sample size provides power to the study, as 81.5% of the DHT of Brazil were assessed. Due to the national scope of the study, information bias may have occurred, since different teams of evaluators with a uniform training lead the evaluation. However, the bias may have been minimized by the size of the sample and by the fact that all equipment, instruments, and supplies were verified in loco. In conclusion, the majority of the PHC services did not present the minimum equipment to provide the curative actions evaluated while only 14.8% performed them considering the presence of a minimum set of materials. Better results were found in DHT that had oral health technician, with higher workload and that plan their activities, as well as in those that had dentists with better working contracts, with degrees in public health and with permanent education. Starfield B. Atenção Primária: equilíbrio entre necessidades de saúde, serviços e tecnologia. 2.ed. Brasília (DF): UNESCO; Ministério da Saúde; 2004. Authors’ Contribution: Design and planning of the study: AB, JBH. Collection, analysis, and interpretation of the data: AB, FNH, JBH. Preparation or review of the study: AB, FNH, AFB, JBH. Approval of the final version: AB, FNH, AFB, JBH. Public responsibility for the content of the article: FNH, JBH. Figure Description of the outcome, considering curative procedures and materials available. DHT: dental health teamsExclusion: lack of minimum dental equipment for service.Filter 1: procedure carried out in the healthcare center.Filter 2: minimum material available to carry out the procedure. a Mouth mirror, explorer, and cotton tweezers. b Personal Protective Equipment: Glove, protective eyewear, surgical mask, protective clothing, and hood. Table 2 Distribution between exploratory variables assessed in respect to the provision of curative procedures of oral health. Table 3 Crude and adjusted analysis between the outcome and associated factors. Table 4 Multivariate Analyses between each procedure and associated factors.